Borough is indisputably one of London’s gastronomic hotspots: home to Borough Market, wine shops, and cosmopolitan street food stalls, it’s the best place to discover London’s culinary scene. On this tour, a food expert takes you for a roaming 6-course meal with wine, chocolate, cheese, oysters, and charcuterie. Ideal for families and food lovers, this small-group tour is limited to 15 people. Your tour begins at Borough underground station, where you’ll greet your guide and head to your first destination. First, try an Italian delicacy. Then, walk to an award-winning warehouse to sample a selection of wine varietals while your guide offers insight into London’s rich culinary culture. In a room laden with wine bottles, sip fine wine and learn about the area’s social history. 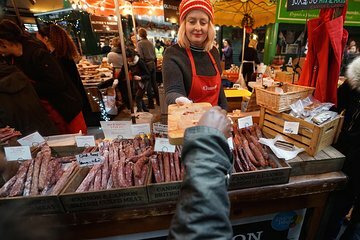 Proceed to Borough Market to sample different cheeses, learn about the production of British charcuterie, and then enjoy freshly-caught oysters at a seafood stall. Continue your journey with a visit to a chocolate shop: learn about the chocolate-making process and taste an array of sweet treats. With a chocolate beverage in hand, take a seat beside the Thames River to learn of its social significance, and then head to a traditional English pub to conclude with a homemade dessert. David was fantastic on our tour of Borough Market! Extremely knowledgeable and friendly. He showed us around the market and the general area also, stopping to point out small things that we would have missed on our own. This is a great experience and I would highly recommend David and this tour for visitors to London! We had a wonderful afternoon touring the market and sampling the vendors, plus learning the history of the market and the surrounding neighborhood with Beatrice, who was informative and inquisitive and exceeded our expectations throughout. Each vendor we visited took the time to explain their foods and allowed us to liberally try anything we were willing to try. Beatrice got us to go outside our food comfort zone and explore our palate using the resources of the market. The 3 hours flew by and we left happy and full after Beatrice spent time helping us plan other aspects of our holiday. An excellent value and something you should definitely consider when visiting London. Of all the tours we took during our London and European 3-week trip, this was by far the best. Our guide, Charlie, really knows her stuff. She had prepared numerous stops with wide array of delectable treats for us to taste and enjoy during of 3-hour tour. This is definitely a tour that you should sign up for. We had a really great experience on this tour. The twelve year old grand daughter really enjoyed it. The food at the Borough Market was great and the experience was really fun. Sarah was our guide for this amazing food tour. It was great to meet some of the people at the market and sharing their passion for food. Sarah was lots of fun and has great knowledge of not only the market, but also the surrounding area. Would highly recommend this tour. Best for a true London experience! Tour guide was fun and knowledgeable! I would recommend this to all ages who want to taste London culture! Our 13 yr old daughter had us return the next day for lunch! Fabulous experience!